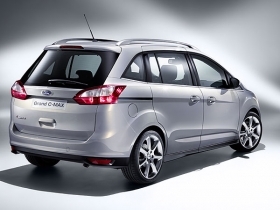 The Ford Grand C-Max will compete in North America against the Mazda5 and Kia Rondo. Ford Motor Co. is stepping back into a U.S. segment it abandoned back in 2007 -- minivans. But Ford's plan for success this time involves the small, seven-passenger 2012 C-Max and exterior styling that attempts to hide one noticeable and sometimes unpopular minivan characteristic. 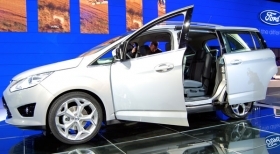 “Sliding doors carry a stigma, which is why the minivan has fallen” out of favor with some U.S. buyers, said Derrick Kuzak, Ford's group vice president of global product development. Also, gone is any minivan reference, replaced by "multi-activity vehicle." The unveiling took place today at the Frankfurt motor show. The U.S. version of the Ford C-Max goes on sale in late 2011. It is one of 10 new vehicles that will be developed for North America on the automaker's re-engineered Ford Focus platform. Ford's use of names is somewhat confusing, though. The five-and seven-passenger C-Max range for Europe was unveiled today in Frankfurt. While the five-passenger model, called C-Max in Europe, will not be sold in North America, the seven-passenger model, called Grand C-Max in Europe, will be sold in North America as the C-Max. Ford has not said where the U.S. version will be assembled. Insiders say the U.S. model likely will be assembled at Ford's plant in Wayne, Mich. The exterior styling for the seven-passenger model has a trapezoidal lower grille, rising beltline and sculpted side surfaces. The vehicle lacks the flat sides that make some minivans resemble “refrigerators on wheels,” said Kuzak. Kuzak spoke Monday at a Ford preview at the automaker's design center in Dearborn, Mich. Inside, the C-Max and Grand C-Max are unmistakably minivan. The interior has three-row seating. The seats in the second and third rows fold flat into the floor. A baby stroller can be stored behind the third-row seat. The model for the U.S. market will offer such up-market features as blind spot detection, a power tailgate and a semi-automatic parallel parking system. The vehicle will be powered by a four-cylinder engine. Ford's first minivan was the rear-wheel-drive Aerostar, offered from 1985 to 1995. It introduced the front-drive Windstar in 1995 and later re-engineered the vehicle and changed its name to Freestar before abandoning the segment in 2007. The seven-seat Ford Grand C-Max in Europe will be called the C-Max in North America. Kuzak said the opportunities are now in the C segment, the largest segment in the world and in North America. That segment is compromised of vehicles that are similar in size to the Ford Focus and C-Max. Today, U.S. competitors for the seven-passenger C-Max would include the Mazda5 and Kia Rondo. The Chevrolet Orlando will arrive in 2011. “People are starting to recognize that unlike maybe in the past, with smaller cars, you are not compromising anything in terms of potential technology, features, comfort, convenience, quietness. At the same time you are getting essentially better fuel efficiency,” Kuzak said. Ford said 10 models will be created off the new Focus platform for North America. Besides the U.S. version of the C-Max, they include four- and five-door versions of the Focus, the electric Focus model, the next generation Ford Escape and Mercury Mariner, and a Mercury sedan. Three other models are under consideration. The gasoline-powered Focus models will debut in late 2010, while the other models will debut later.